A slideshow is a very convenient way of showing off your professional skills and becoming an excellent presenter. In recent time, slideshows have become a great way of telling a story without making the narration annoying. If you're looking for software that works effortlessly for your Mac computers, you’ve found the place. Using the software given below, you can create a beautiful slideshow for any occasion without any special skills. This slideshow maker works perfectly for Mac OS and can be used for making movies and slideshows quickly. Do you want to burn videos to DVDs? This application makes it possible. Import from iMovie and iPhoto files and combine everything effortless to add more effects to your slideshow. Create personalised slideshows using themes and editing features. Add your credits and captions, background music and other effects. It is compatible with almost any version of Mac. It is a slideshow making program exclusively for Mac. It has a beautiful interface that makes working on slideshows a pleasure, and it’s very easy to learn and use. iPhoto has an extensive range audio effects and shortcuts that make everything effortless. You can add your custom effects and change something quickly when you feel unsatisfied with something. Aside from this, it has great editing tools and effects that make your slideshow attractive. It organises your photos so that you can share your slideshows more easily on any social media platform. 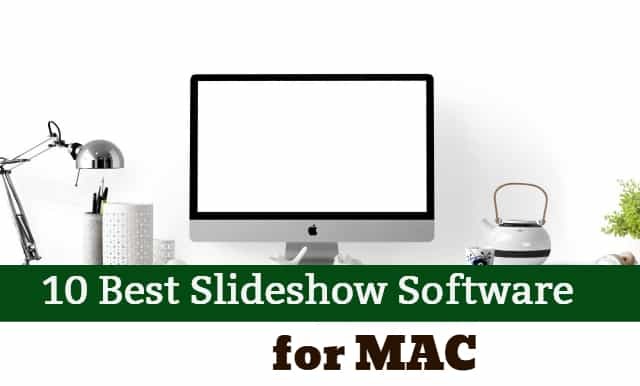 Here we have another highly recommended slideshow maker that is used for Mac computers. It enables the user to drag and drop photos and videos so that you can create beautiful slideshows in the simplest way possible. Add music and other effects to make things interesting. A cool feature iSkysoft provides is that you can convert the videos into another format or save them to a DVD quickly. It offers thousands of free DVD menu templates. If you want to save time and money while making your slideshow, you have found it with iSkysoft DVD Creator. It doesn’t require any extra tools while converting to DVD and is easy enough to understand. This is great software for full-screen slideshows. It supports EXIF data and JPEG transformations so you can easily rotate and zoom on pictures with the program. You have your basic editing options with background changers and sound effects. EPEG loads the photos quickly, so you're essentially saving a lot of time with creation. The user interface is fairly straightforward to understand although it doesn’t have as many features as some other slideshow makers might. This is a multimedia editor that makes impressive slideshows using photos, videos, texts and sounds. You have the drag and drop option available, so you don’t even have to bat an eyelid to get your data in on place. Add sound effects and give your photos an authentic feel with HyperEngine AV. Sort through your pictures quickly and create DVD quality slideshows with studio effects. Although it is slightly tricky to install, the end product will always leave you satisfied. Cocoa is your standard image viewing and slideshow making software. It is open source and totally free. Download it online and go crazy with your presentation making. The app supports Apple Remote, user meta data and GPS mapping. Some features available for editing is low, but it’s still handy enough if you want something for quick use. If you want to create professional looking slides, this is the application for you. Use your photo collection any way you want to create a slideshow and save them in a QucikTime compatible format. Slideshow Magic has an easy to navigate user interface and can handle DVD imports well enough. DVD burning requires third party software, and uploading requires you to have your FTP client. Here is a very simple slideshow maker for Mac. It has a handy drag and drops tool that makes organising photos a delight. The transition effects available with Visual Shadow do not require any extra coding or downloading. The application has some great visual effects, and you can create slideshows within minutes. It has an interactive user interface to make tasks easier. Navigation is easy, and you don’t require a Flash player to view your creations. Visual Shadow is a little tricky during installation, though, and you need to be patient with it. Do you want a simple slideshow maker that doesn’t have too much going on with it? 4k Slideshow Maker is the one for you. It is very simple to use and doesn’t include any extra useless features that you might not require while you're making your presentation. It does include a host of transition effects and music in the database for a multitude of options while you make your slideshow. It supports HD displays, and you can save your output in different formats. You can now easily create slideshows of the highest quality using PhotoStage Slideshow Producer. It supports recording a narrative audio while you go through your presentation. It customises all the options to your need and makes your tasks simpler. It comes bundled with many slideshow tools and can combine different media formats into one slideshow presentation. PhotoStage comes packed with features and is very easy to install. You have an intuitive user interface that can predict what you want to do and has full HD support for your final presentation. Some of its features are difficult to use in the beginning but you get used to them the more you use them.